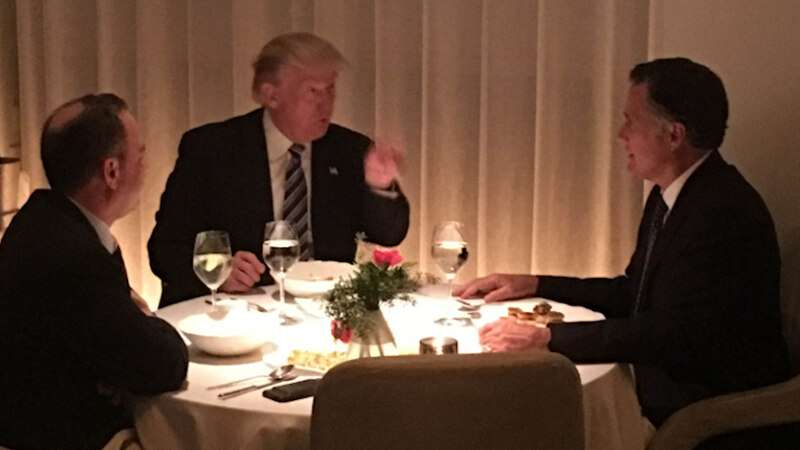 UPPER WEST SIDE, Manhattan (WABC) -- President-elect Donald Trump and Mitt Romney had dinner on the Upper West Side Tuesday night. The dinner at the Trump building was also with future White House Chief of Staff Reince Priebus. The men met for dinner at Jean-Georges restaurant located in the Trump International Hotel and Tower off Columbus Circle in midtown Manhattan. The exclusive restaurant, which has received three Michelin stars, has a dinner menu featuring a variety of meat, fish and pasta dishes. When asked if the meeting was going well, the president-elect flashed a thumbs up. Romney, a harsh and brutal critic of Trump during the campaign, is apparently a finalist for Secretary of State, along with several others. But this quite public dinner meeting is a first for those in the running.